Oh man, this is a good one. Greate visual style and music and really smooth controls. There's a few negatives but nothing that some quick polish later won't fix. Like others have mentioned, the steering is a bit too punishing when you begin scrapping the walls. 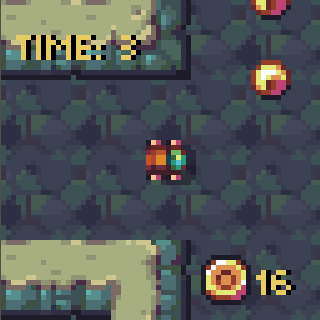 It's very hard to get your momentum back which is important for the later levels (I got up to Maze 7 btw). Additionally, the maze image at the start is great but for the first 2 mazes I thought I was the green dot and the finish line was the empty space. Overall, fantastic game. One of my favorite of this jam. Great job! Terrific game. Made me think in Biker Mice from Mars (SNES). Loved the mechanics because I enjoy memory tests. Turning feels good. It would be great to show to the player (at least during the first 2 levels) the start point in the map. I figure it out in maze 3, in the 1st and 2nd mazes I though the starting point was the green rectangle. Lovely graphics as has been said, and I agree with the turning is a bit slow as I kept scraping the walls a bit, which is a bit crucial near the later levels where every second counts as you try and remember which small bit you go down! Nice graphics and music. Controls are smooth. I run into two little bugs though. Every time you restart game music starts over, but previous audio file doesn't stop. Sometimes you can ride inside the wall. I made a screenshot. Really nice! Plays really well, graphics are gorgeous, sounds really good. The game really feels like it fits the resolution - gives just the right balance of not being able to see too far ahead but retains playability. Really loved this one, the mix of skill (inertia feels good), memorization of the circuit and coin collecting, and especially the super-short levels with only seconds to find the exit. Good work! As pointed out by others already the steering could be faster. Maybe even just reducing the slowdown when hitting walls would help to keep the drifting and offset the steering issue? Great premise! I had a blast playing through it. Really nice visuals too, super meaty. 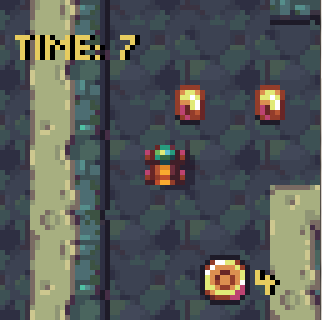 One critique: the steering is maybe a little too punishingly slow, robbing some enjoyment from the game; it's already fun enough trying to remember the maze, I don't think you need the additional challenge.